Last year was a great year, and we hope that this year will be even better. 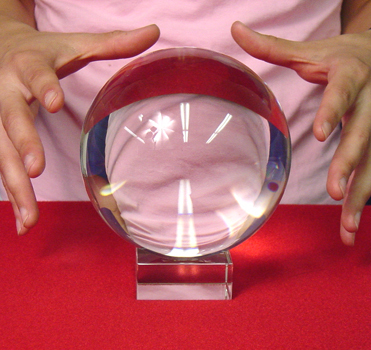 To stay a step ahead of the game, a look into the old crystal ball is in order. What do we see? We see thousands of potential customers with a sudden increase in their bank account. Wait, the fog is clearing; it is a surge in deposits. These potential customers are all depositing checks that look very similar. We see three or four – no, it’s three letters. They all have an “I” and an “R” and an “S.” That’s it! They all have IRS tax refunds. Okay, this means that some healthy car-deals are possible because they have down-payment. This means that we need to get these customers into your store before they buy from someone else. Why don’t we do this; let’s send them some direct mail from Hill Marketing Group, giving them a reason to visit – so you can close them! The crystal ball reveals that they will buy from *somewhere* soon, but there’s too much fog to read the plate frames. It could be you, or it could be one of the other dealers near you. The only way to tell is to ask yourself: what do I have planned for then? Have you planned the necessary marketing strategy that would result in your name on the freshly-delivered unit’s plate-frame? If not, then give us a call or send us an email to find out what your options are. We are fully-stocked with the perfect combination of mailers, data, and affordable pricing. Our *well-thought-out* marketing programs are turn-key, so all you have to do is order and we do all the rest (except the test-drive, write-up, desking, F&I, and delivery)! It doesn’t get any easier than this. We even provide your sales staff and managers a training conference call just to make sure that everyone is extra-sharp and on point! Remember, they will buy from somewhere. What you do between now and the time they leave their house to buy will determine whether or not they include you as an option. Why not send them a neat credit card offer with an insured cash prize that’s only available at your store? That’ll get ‘em in. Or how about a buyback letter that informs them that you’ll pay most for their trade? Or what about a special-finance mailer using credit data from Experian, Trans-Union, or Equifax? Postcards? Saturation? Let’s talk! Automotive Direct Mail That ROCKS! Notice the look on Stu Hamm’s face. He’s blown away at what Joe Satriani is squeezing out of his Ibanez! Even though Stu has played bass for “Satch” for years and has rehearsed countless hours with him, he still gets floored when Joey the alien emerges during the energy of a live show! So it is with us at Hill Marketing Group. Even though we create concepts, design pieces, and strategize around the meeting table for hours at a time, we still get blown away when we see just how radical of an impact our direct mail has on the dealers that we work with. Highest response rates that dealers have seen in years! Fast turnaround time; sign today, sell units next week! Immediate results. Ability to save a month. Packages for all budgets, never too expensive! Wide variety of quality pieces. To find out for yourself and experience direct marketing like never before, give us a call and try something out. Right now we have a Greeting Card piece that looks like a Christmas card, but is really a serious direct-mailer with a killer call-to-action. Also, our Granite Bay Acceptance Card Mailer is putting ear-to-ear smiles on dealer faces nationwide. From saturation pieces, postcards, and custom letters, we have it all. Are you ready? Don’t be like the many dealers that procrastinate putting together a Thanksgiving Turkey Mailer, only to find out that it’s too late to drop. Get the process started now so that when crunch time arrives, you can focus on what you do best: selling new and used vehicles from direct mail leads! Free turkey coupons are limited, so get the ball rolling today and click here for samples and prices. Nothing breaks the heart of a direct mail company more than having to turn away business. But if you don’t take the first step soon, you may have to wait until next year to sell more vehicles. Click on the “Buy Our Stuff” tab located at the top of this page to get started! For US Capital Inc., MasterCard Mailers, Granite Bay Acceptance Mailers, and Title List buyback & conquest mailers, scroll down and have fun!